1. Ground clearance of the fence is not to exceed 100mm. 2. Vertical Pickets : The spacing between any adjacent picket shall not exceed 100 mm. 3. Horizontal Rails : The spacing between the horizontal rails shall not be less than 900 mm. 4. 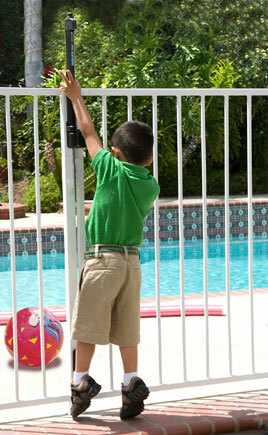 Effective Height : Pool fences and gates shall have an effective perpendicular height of not less than 1.2 Mts. 5. Pool Gates : Gates shall be mounted so as to swing outwards or away from the pool area. 6. Pool gates shall be fitted with a self closing device so as to close the gate after opening, and will prevent the gate from reopening without manually operating the catch mechanism. 7. The pool gate or latch or release is to be located at a minimum of 1.5 Mts from the ground, or the latch must be shielded if located below 1.5 Mts.